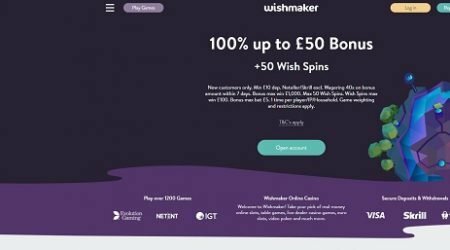 Wishmaker Review: Collect your 100% up to £50 + 50 Wish Spins Bonus! 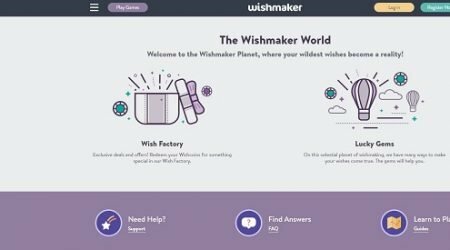 Wishmaker is an online casino which guarantees you ultimate entertainment and a place where all your wishes of playing the best games are fulfilled. They are here to ensure that you enjoy live casino games, table games and slots from various, well-known software providers. 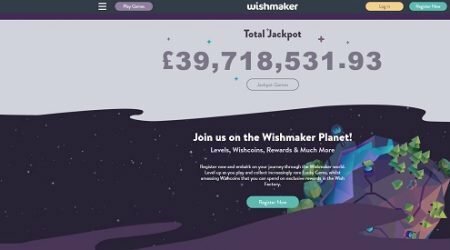 When gambling on their site, you will be bombarded with great bonuses, you'll get trophies and rewards, and you will level up and at the same time be earning wish coins.Wishmaker Casino is an online gaming site that you can trust in as it is licensed by the Malta Gaming Authority and the UK Gambling Commission. You can, therefore, place your bets here safely without the fear of your money vanishing into thin air. Moreover, they ensure that your data and gambling information is safe and secure by encrypting it with a strong SSL so that no third party can get their hands on it.Although Wishmaker casino is legal in the United Kingdom, there are various countries where it cannot be accessed due to local laws. Such countries include Brazil, United States of America, Hungary, Belize, Spain, Portugal, Belgium, Panama, Curacao, China, Costa Rica, Denmark, Cuba, Greece, France, Italy, Romania, Malaysia, and Malaysia. Before you decide to register on their site, please take a moment to make sure that you are eligible to sign up from the region you are based. Wishmaker Online Casino has a variety of bonuses and promotions that include the welcome bonus for new members as well as other rewards for loyal players. For instance, every time you play for real money, you are rewarded with gems, and as you continue collecting them, they will open doors for you to win more rewards. Wishmakers Casino offers you an exciting 100% match welcome bonus as a new member once you deposit €10 or more. The welcome match bonus is accompanied by 50 bonus wish spins. On your second deposit, you will be rewarded with another 100% welcome bonus of up to €150. Other offers are also available: the Wish Maker where all your wishes will be granted by a magical wishing well game; lucky gems which enable you to open exclusive gifts; and the Wish Factory which allows you to use your wish coins and lucky gems. Wagering requirements are set in place to help prevent crimes such as money laundering and to prevent customers from withdrawing the bonus and leaving for good. The aim of the casino is to make money obviously, so there would be no point in allowing customers to sign up, collect the bonus money, and then just disappear with a bonus 100 euros. The wagering requirements for the welcome bonus on this site is 40x, which means that the welcome bonus must be wagered 40x before it can be withdrawn. After you make your first deposit, you will get a 100% match bonus and 10 bonus spins on slots. Over the next four days, you will receive an additional 40 bonus spins which are split into 10 spins/day. This is the best way to utilise your bonuses and have as much fun as possible. At the moment, Wishmaker casino does not offer a VIP program to its loyal members. Even so, this is not something to worry about since there are plenty of other great benefits that you can take advantage of, such as the wish factory. You can collect as many wish coins as possible and exchange them later to earn bonus spins, as well as enjoy the wish well for other exciting prizes. Wishmaker online casino is owned by MT SecureTrade Limited and was made available to the public just in 2018. It incorporates various game providers such as NextGen Gaming, Barcrest, Push Gaming, BetSoft, Scientific Games, Merkur, Yggdrasil, Genesis Gaming, Bally Wulff, Rabcat, BetDigital, Lightning Box, Quickspin, NetEnt Live, Evolution Gaming, Blueprint, Big Time Gaming, Just for the Win, Rabcat, and ELK Studios. In other words, at this casino, you will find great games from all of the best game developers in the gaming industry. Wishmaker Online Casino boasts of various slots which are classified into fruit slots, video slots, classic slots, and 3D slots. You can enjoy playing these slots without registering at the casino’s website so that you can have some first-hand experience before paying for the games. When it comes to design, the site has a clean and flexible interface with a hidden menu that appears only when it’s needed. You can also enjoy Wishmaker games on your mobile devices since the screen is clutter-free. Wishmaker Casino provides you with awesome table games such as roulette, baccarat, blackjack, craps, poker, and Dream Catcher (a wheel of fortune style game which is a favourite to many players). All these games are fun, and each one is perfectly-suited to different types of players. The same applies to its live casino games which will leave you thrilled throughout your gameplay, as they bring the casino to the palm of your hand. Other games include progressive jackpots that are suitable for players who like to play for big wins. Wishmakers provides you with various deposit and withdrawal platforms that are accessible in most countries. When it comes to withdrawals, you can withdraw using a number of popular methods that include Neteller, Skrill, Paysafe, Euteller, Trustly, Visa, and bank wire. The first four methods mentioned are all instantaneous, while the last three take from 1-3 days to clear. When it comes to deposits, the methods used are the same ones you use for withdrawals. You should keep note that Wishmaker Casino keeps the rights to divide your payments into four equal instalments for winnings beyond € 50,000.00 and 10 instalments for winnings beyond € 100,000.00. Your winnings will be paid in your local currencies such as (SEK, CAD, EUR, NOK or USD and if you’re from Great Britain, you will be allowed to make payments using Pounds Sterling (GBP). Wishmaker Casino has a great customer support service with agents that are well trained. They are available from 9am-1am throughout the year, and they will answer all your queries in a professional and precise manner. You can reach them through their email address or live chat, with live chat being the quickest way. Unfortunately, however, the casino has not made a phone number available that they can be reached through. In case you need help with your account, and you do not wish to utilise the email and live chat function, you can visit the site’s FAQ section which has plenty of information that will assist you. This is available in various languages such as English, German, Swedish, Norwegian and Finnish. In this section, you will find all the answers to your queries along with a simplified guide of the terms and conditions of the casino. To summarise, here are some advantages when you play in Wishmaker. First, the casino provides its clients with a wide variety of live casino games from professional game providers. It also provides you with a variety of promotions. And, it has an interface that is easy to use on all platforms such as in mobile devices and computers. A few disadvantages that it has are high wagering requirements on bonuses, limits on bonus withdrawals since they pay out in installments, and lack of customer phone support. Generally, Wishmaker is an amazing online casino with thrilling games from various famous providers that have made a name in the gaming industry. Moreover, when it comes to bonuses and promotions, the ones on offer here are very attractive to new players. They also offer great security by possessing two licenses and strong SSL encryption which means players are always safe. Gambling information, including deposits and withdrawals, cannot be leaked to third parties.